Each year smoke taint ruins vast quantities of wine worldwide, causing huge financial losses. Until now, there has been no satisfactory solution, but a new method by Alfa Laval may prove to be a breakthrough. Taste in wine, as in other things, is highly subjective. However, it is a safe bet that bouquets of burnt bacon, sweaty socks and ashtrays have little mass appeal. These are some of the flavours associated with smoke taint in wine. Each year around the world, smoke taint from wildfires adjacent to vineyards renders huge quantities of grapes and wine useless, causing severe financial damage. 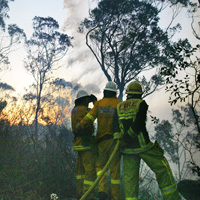 For example, it is estimated that bush fires in the King and Alpine valleys in Australia in 2007 caused the local wine industry to lose as much as 90 million Australian dollars. Similar smoke taint in wine may be caused by contamination by wild yeasts of the Brettanomyces bruxellensis type. And this problem has spread markedly during the past few years, according to Rolf Zimmermann, leader of the wine analytics team, and Katharina Schneider, technical assistant with the Agroscope Changins-Wädenswil Research Station (ACW), which is one of five Swiss Federal agricultural research stations. It has carried out Brettanomyces research for more than 10 years. Unfortunately, the warming climate is set to aggravate the smoke taint problem, both as it contributes to the risk of wildfire and as it encourages the propagation of yeast. “This type of yeast is mostly found in warmer viticulture regions, so climate change could further propagate the problem,” says Schneider. This makes the future look rather bleak for wineries left with large quantities of smoke-tainted grapes or wine, especially as there is currently no satisfactory solution on the market. Reverse osmosis filtration has been used, but not only is this costly and energyconsuming, but the process may also remove desired flavour and texture along with the smoke taint. The winery might end up with lower-quality wine that could be sold but would likely damage the wine’s brand reputation. Another solution has been to filter the wine and then distil it, but apart from being energy-consuming, this subsequently causes problems with tax regulations. thorough tests to find the right membrane type, and now it looks as if it is getting there. The results look promising. The filtered wine contains practically no undesirable substances.